Shocking! Never Before Revealed: The Truth about #Barkbusters! 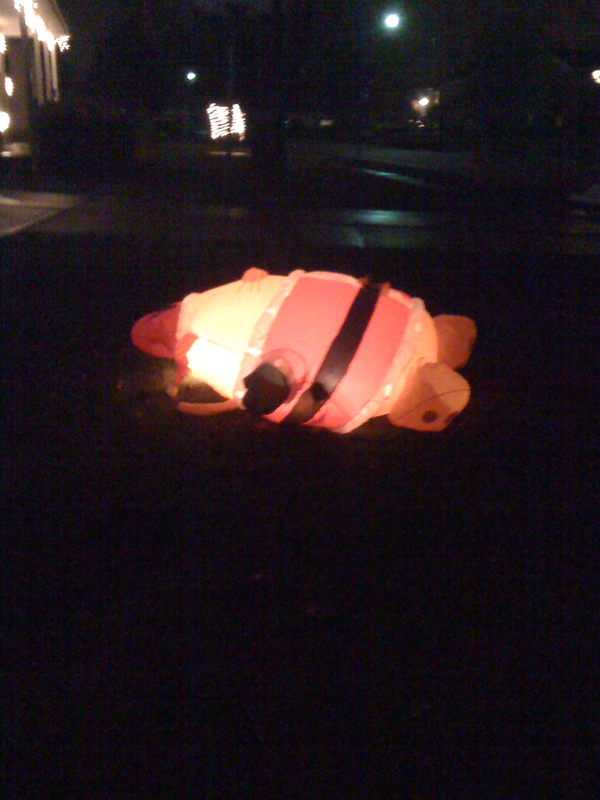 It was a dark and stormy night…make that a dark, cold, and stormy night in November 2009. 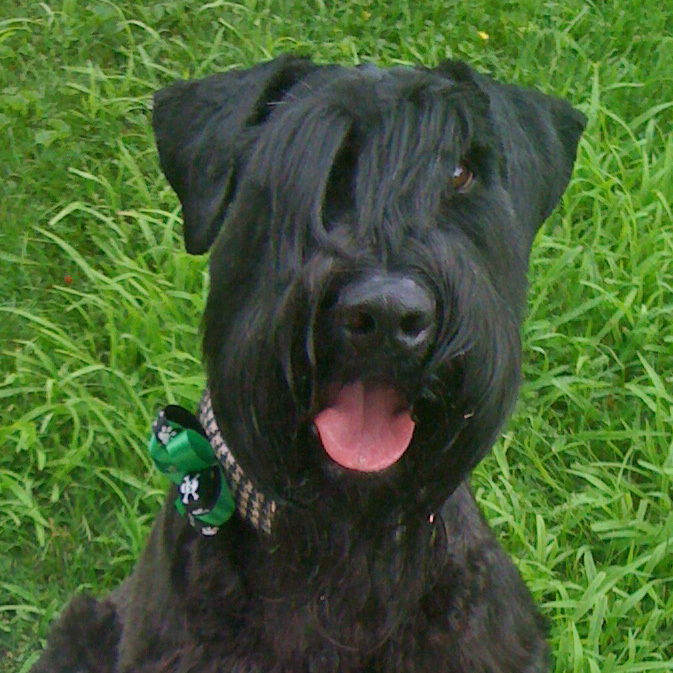 Zorro, the Giant Schnauzer known to all as @IamZorro on Twitter, was performing a routine security check of the perimeter of his backyard. 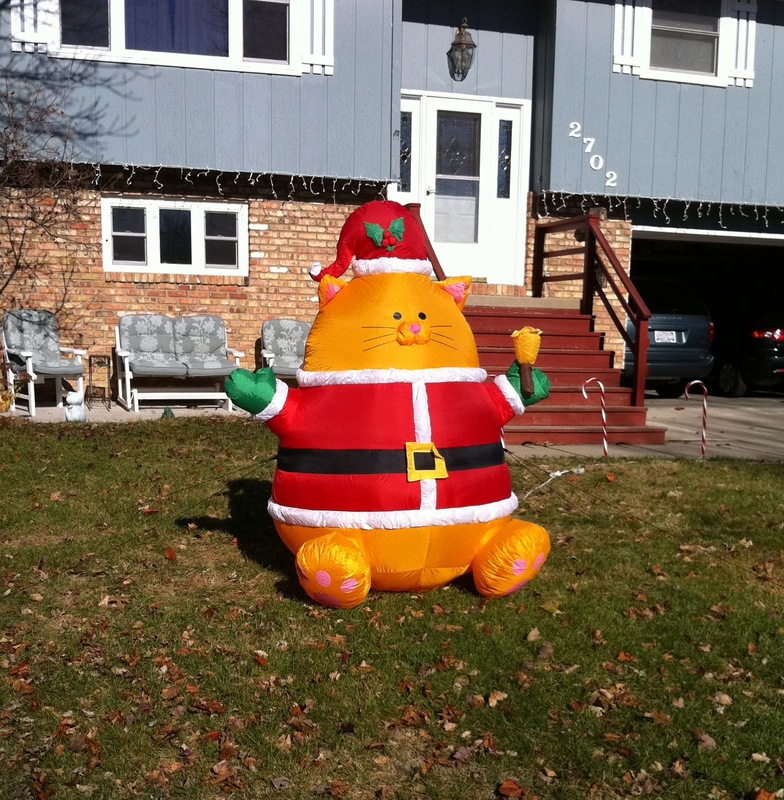 Out of the corner of his eyes, he caught sight of unusual activity in his neighbor’s front yard. 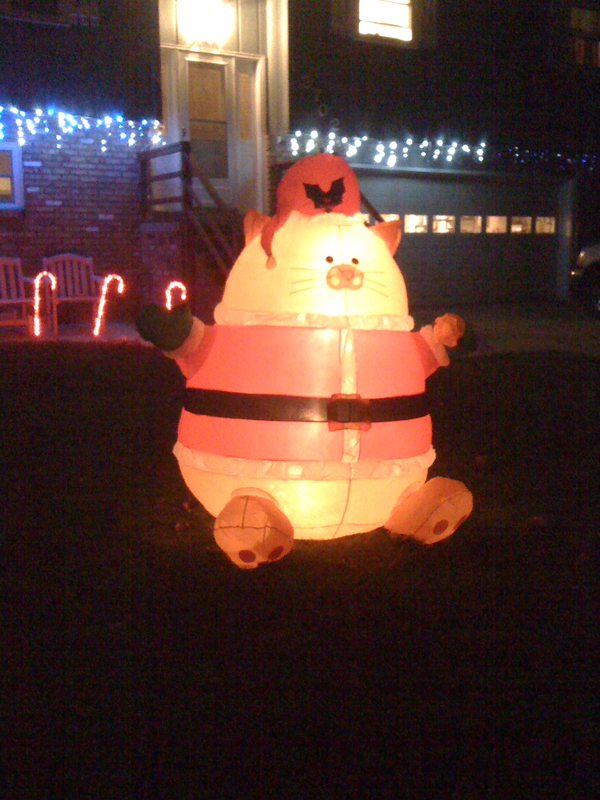 This “thing” glowed and swayed with the wind. This could not be good. So, Big Z did what all superior security guards would: He barked. He howled. He lunged at the fence separating him from this intruder. He made so much noise, his people made him come inside. But still, the intruder glowed and mocked him through the window. All night long. By morning, the glow was gone. The next night, the thing was back. Realizing he needed back-up, Z consulted with Twitter pals, Bosco (@BigBoyBosco), Tiger (@TigerthePup), the Baron (@BaronVonOdem) and SnowyWestie (me). We were intrigued and perplexed by this unwanted intruder. First, it was ugly. It was sooo ugly, we just had to bark at it. Even the combined power of three very large dogs and two tenacious terriers did not seem to faze this ugly thing. It was about this time that Bosco started calling the ugly thing “Fugly”—will let you guys figure that out for yourselves. Night after night, Fugly swayed back and forth, mocking, just mocking us. 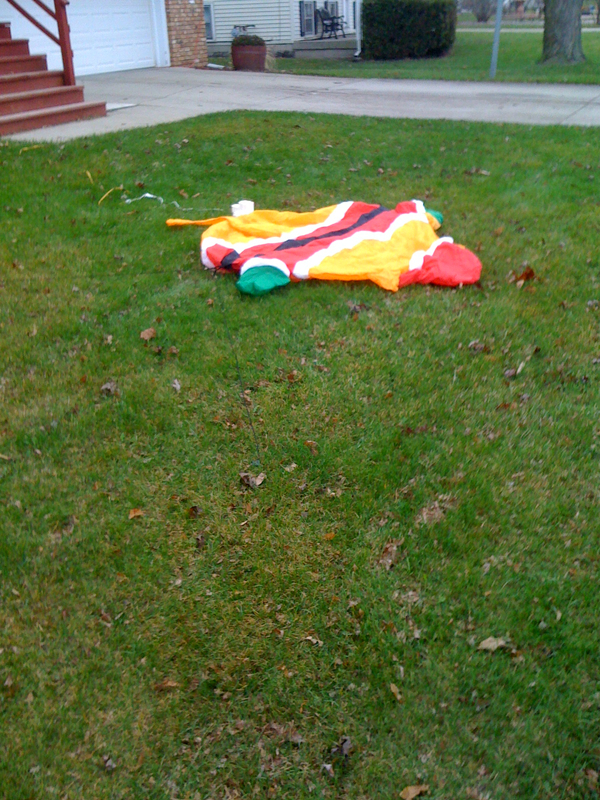 Come morning, Fugly was just a harmless blob on the ground. 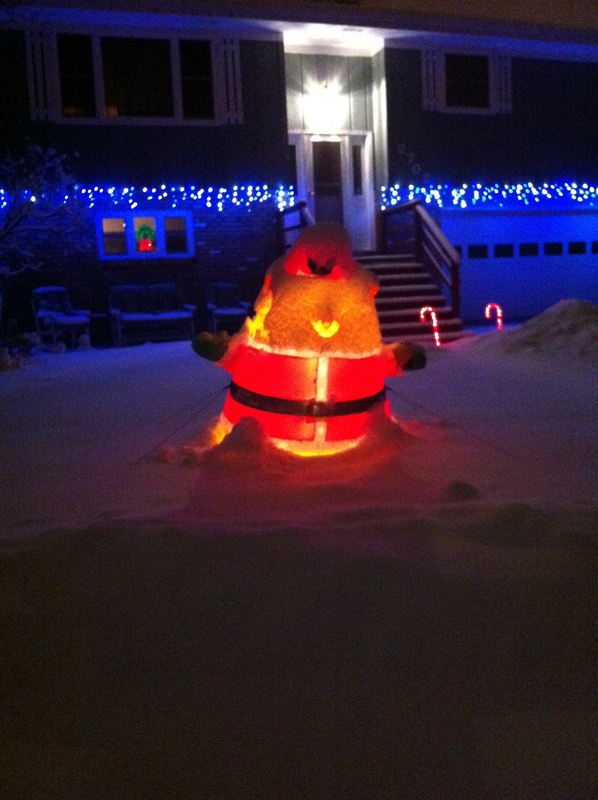 Even a coating of snow could not keep Fugly down once the sun set. One night, we all huddled and howled in Z’s backyard, frankly getting a bit frustrated by our inability to rid the neighborhood of this vile creature. It was Tiger’s idea to plan stealth attacks on Fugly. Maybe we could pee it away. Tiger’s idea; Tiger was the first to go in. While we all filled our bladders with some of @HanksBaconBeer and plenty of water, Tiger crept across the yard, slithered over the fence, attacked from the back side, and let it rip. The Baron attacked next, hitting Fugly squarely on the front side. The thing was wet. It was so cold, Fugly should have turned into an instant ice-cube (which we could then melt). Dawg, this Fugly was tough. Having had just about all he could take, Bosco suddenly and recklessly rushed Fugly, knocking him over with a quick right hook. Fugly swayed, hit the ground briefly, then popped back up. What was this thing? Zorro and I decided to try a two-prong attack. Using darkness as his cover, Zorro went for the high angle. Blending into the snow piled on the ground, I went for the creature’s lower region. Again, Fugly stood his ground. Flash-forward to mid-December. Fuglies began popping up all over the country. In Tiger’s neighborhood, in Bosco’s, in Baron’s, and in mine. These things were everywhere! Worse, these Fuglies were bold, mocking us night and day. They appeared in groups, swaying in the breeze, just taunting us to do something about them. We knew we were out-numbered. We needed back-up. We were hoarse from barking night and day. So, we did the only thing we could do—we created a Twitter hashtag and put out a call for additional voices. #Barkbusters was formed. The response was overwhelming. #BarkBusters together created such a din that the skies opened and dumped foot after foot of snow across the countryside. By morning, Fugly was nowhere to be seen in Zorro’s yard, replaced by several feet of fresh snow coated in a thick sheet of ice. We’d discovered the combined awesome power of #BarkBusters working as one very loud howling group! 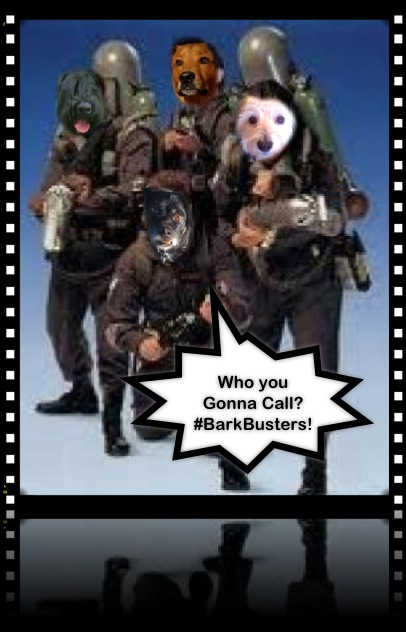 Since that night, #BarkBusters have put this power to work for the good of our Twitter pals. We learned #BarkBusters could bark away storms, keep intruders away from friends’ homes, even bring rain to parched areas. #BarkBusters are still growing and still learning to harness the energy produced by barking, howling, hissing (yes, there are #HissBusters, too, who come with nice sharp claws) animals all over the world. There are so many #BarkBusters and #HissBusters, it is impossible to include them in a 140-character “All Call” alert. So, we depend upon our worldwide network. Put out the #BarkBuster call for help, and you’ll find assistance. Back to Fugly…. we thought the snow had finished him off. We thought Fugly was destroyed. 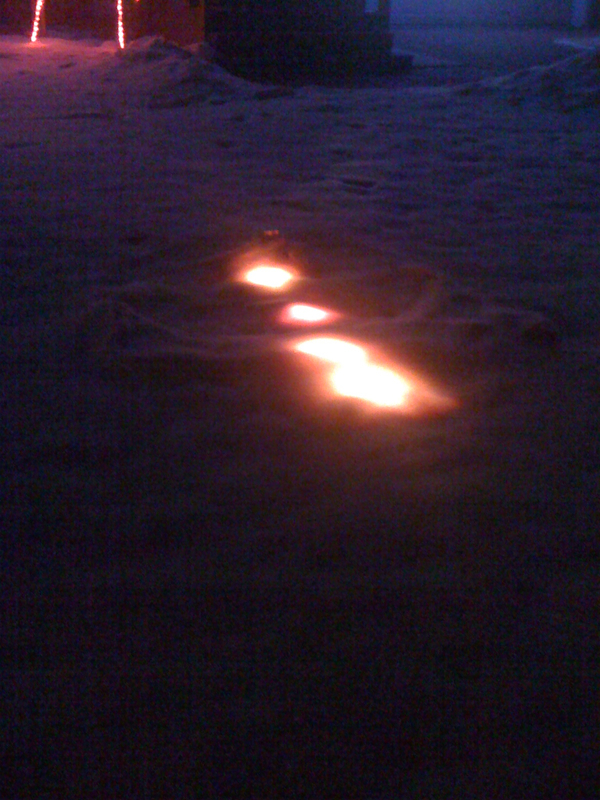 Then, late one night, Zorro posted an unbelievable picture on Twitter. Fugly lives! #BarkBusters and #HissBusters, please add your names to our Roll Call below in the comments below. Tell us about your most memorable #BarkBuster / #HissBuster adventure. Seeing an adventure saga in our future! 5 Responses to Shocking! Never Before Revealed: The Truth about #Barkbusters! I remember the time @TigerThePup had me barking away the rain from where he was… for hours, it seemed… Then @BigBoyBosco sent me a message that Tiger was messing with me. I was the new pup.. guess that was my initiation! Lucy, Puppy Princess is IN! Just last night I had to use barkbusting powers! A frog, yes, a frog, dared to jump in our home when the door was opened. Mommy was screaming and I had to bark it away. (I showed just a little bit of big teeth at it to make sure it knew I meant business!) That frog went hoppin’! Good job, Puppy Princess! Amazing what a little #BarkBusting charm can accomplish!